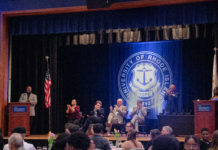 MAP-Works, or Making Achievement Possible, is a new student retention program that the University of Rhode Island has implemented to improve the success rates of freshmen students for the past six years. In the program, freshmen respond to survey questions addressing their academic behaviors such as sufficient study time, taking notes, turning in assignments, class attendance, time management and academic self confidence. Questions on homesickness and campus involvement are also asked. The final report gives freshmen an overview of their expectations of themselves and whether or not MAP-Works believes in the success they wish to achieve. The program compares the individual student’s answers to past student answers, as well as other data specific to URI such as retention rates and average grades freshman year. Once this data is available to staff and faculty, the student is accessible to many sources of aid around campus, particularly their URI 101 professor and mentor. But does MAP-Works actually make a difference in each year’s developing freshman class? Since it’s creation in 1994, over 1,500 Universities have implemented MAP-Works as a channel to connect students and faculty to improve the lives of college students and their experience. In participating schools, MAP-Works has shown to improve efforts in freshmen students struggling to adapt to their new environment and workload. At University of Alaska Anchorage, a 5 to 6 percent increase in retention was seen within one year using the program, likewise a 4 percent increase at Central Michigan University. The first year college process is difficult for some and easy for others. MAP-Works strives to help students find their place in their community and keep their grades up in hopes that the road to graduation will not be a stressful journey.